Deviled eggs are something I've come to love as an adult that I hated as a kid, so I figured it was time I tried my hand at them. Plus they were a dish that I could make ahead which would require no use of the stove or oven the day of the party! Hurrah! I used this recipe as my starting point. 1. I have always had issues hard boiling eggs, this explains why! You don't actively boil them. They should be called "Sat in hot water eggs" instead. I had no problems with any of my eggs being under cooked. 3. These were really tasty and super easy. You could hard boil the eggs a couple of days in advance to spread out the party prep even more. 4. I have read that if you lay the eggs on their side for a day or two before boiling them, that the yolk will center up and you will have "perfect" deviled eggs. I didn't have enough fridge space to be laying a dozen eggs on their side, nor was I really too overly concerned with how centered the yolks were. Should you have the desire to go all Martha Stewart at your next gathering though, you are now armed. They were delicious! 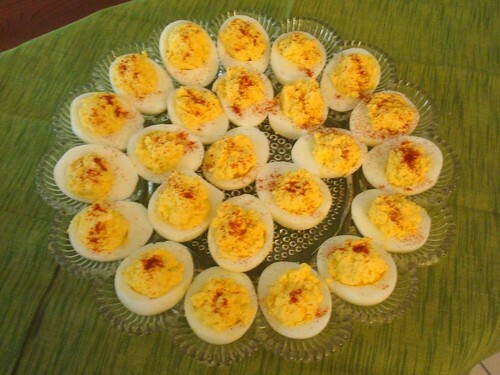 And the best part about making deviled eggs: You get to use your awesome deviled egg platter.